Barrel Mounted Motorized Grease Transfer Pump that we offer comes with drum cover, SS filter gauge, pressure relief valve and pressure gauge (0-350kg/cm2). It is suitable for 180 kgs standard grease barrel. 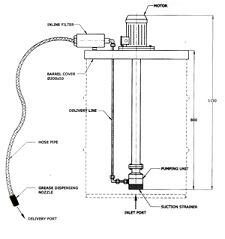 We are counted among the top Manufacturers and Suppliers of Motorized Grease Transfer Pump. The manufacturing of our Motorized Grease Transfer Pump is done using the latest techniques under the strict vigilance of experts.